Sydney Theatre Company and UBS presents, THE RESISTIBLE RISE OF ARTURO UI, by Bertolt Brecht, translated by Tom Wright, at the Roslyn Packer Theatre, Hickson Rd. Walsh Bay. 21 March - 28 April. 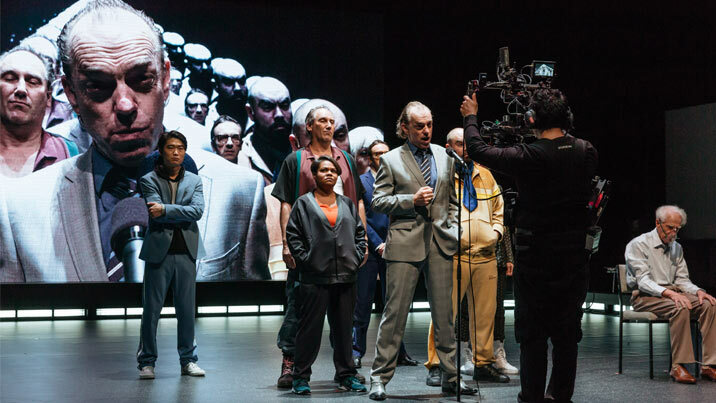 THE RESISTIBLE OF ARTURO UI, a play by Bertolt Brecht, in a Translation by Tom Wright, with Hugo Weaving, and directed by Kip Williams, playing at the Roslyn Packer Theatre for the Sydney Theatre Company. Brecht at the rise of the Nazis, fled Weimar Germany and lived in Scandinavia. It was in Finland in 1941 he wrote THE RESISTIBLE RISE OF ARTURO UI. He soon after found 'sanctuary' in the United States. This play was a satirical, political parable, an allegory concerning the rise of Adolf Hitler. With an eye to having the play produced in the U.S. and inspired with his admiration of the American cinema (James Cagney, Charlie Chaplin) and the gangster genre (not for the first time: HAPPY END; THE RISE AND FALL OF THE CITY OF MAHAGONNY*** THE THREEPENNY OPERA), he created Arturo Ui in the world of the Capone's Chicago. Big, bold 'cartoonish' characters in short scenes that revealed the 'epic theatre' trappings of placard signage, direct address, bright untheatrical lighting etc that broke the fourth wall and created the 'distancing effect' (often mistranslated as 'alienation') to 'historicize and address social and political issues'. The play was not seen in the U.S. and Brecht having testified before the House Un-American Activities Committee (HUAC) returned to Europe in 1947 (the day after his appearance), finally settling in East Berlin in charge of the Berliner Ensemble Theatre. He died in 1956. Brecht never saw a production of his play. THE RESISTIBLE RISE OF ARTURO UI had its first production in Stuttgart, West Germany, in 1958, with a production quickly following at the Berliner Ensemble, Directed by Manfred Wekwerth, starring Ekkehard Schall, as Ui. I have an indelible memory of my first experience of this play at the Old Tote Theatre Company in the old Parade Theatre, Directed by Richard Wherrett and starring John Bell, in 1971. In the original play the allegory made historical figures appear as gangsters: Ui representing Adolf Hitler; Giri, as Hermann Goring; Roma, as Ernst Rohm; Givola, as Joseph Goebbels; with Clark, the stand-in for Franz Von Papen; the Vegetable Dealers representing the Petty Bourgeoisie; the Gangsters as the Fascists. The Sydney Theatre Company text "translated by Tom Wright" is more than a translation, it is a very free and contemporary adaptation, which makes little, or next to no allusion to the gangsters as denizens of Chicago, and with only a fairly 'abstracted' (though amusingly clever) reference to Adolf Hitler, that involves shaving cream. As well, it has been re-sized for 11 actors with some roles excised and/or re-fabricated into 'mashed' characterisations, cast in a non-binary manner (i.e. female actors assuming readings of usually male roles) and a contemporary 'spin' to nationalise (appropriate) the text as an observation of Australia. Chicago in the original being Germany, in this modern adaptation at the Roslyn Packer Theatre becomes The City - Sydney; Cicero standing in for Austria, in this play, becomes 'Millstream' (ironic to have this play in this nomenclatured theatre, so near , geographically, to the Packer family's controversial casino project and Barangaroo development, that had NSW State Government approvals, don't you think? And, with the major sponsor of this Brechtian/Marxist play being UBS - a global firm providing financial services?) Mr Wright's play, then, is a serious change from the original. Great political villains should absolutely be exposed - and preferably to ridicule. Because they are in fact not great political villains at all, but rather perpetrators of great political crimes, which is something entirely different. The intellectual density and politics of Mr Wright's play, built about the super-structure of the original play form, is marvellous to grapple with even if it is does not have the comic-book accessibility, or audacious humour of the original Brecht, and decidedly demands, more needfully, the attention - a skill - in the theatre, of a comfortable academician insight to grasp all that Mr Wright has attempted to utilise the original play's 'garments' for. The Program essay-interview is a helpful guide to digest before watching this production, I reckon - it bristles with particular logics and explanations of a stimulating kind. Initially written as an allegory for the ascent of Nazism in Germany, this play about a gangster who rises to dominate his city has since become a story that resonates both forward and backward in time. In one way, the work's critiques of fascism and the corrupting forces of capitalism make for a harrowing parody of the ease with which democratic freedom can be taken away. In another, its study of the evolution of the central character offers up a revelatory insight into the performance of power, the theatre of politics and the construction of a public identity. ... As such, the world of this production is both contemporary and Australian. 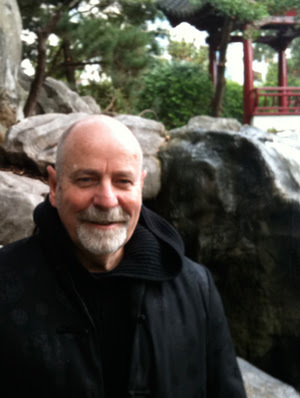 Translator Tom Wright has found a remarkable contemporary idiom in his version that activates the social. economic and political links between our context and Brecht's (both the 1930's/40's Germany Brecht lived in and the 1930's Chicago setting of the original. ..." - Hmmmm? Really? Do you think so? - Mr Williams goes on: "... At its core it is a piece that has a heightened awareness of modes of performance, not only in the story itself, but also in the telling of it." To some of that end, Mr Williams and his team of creatives further explore the use of 'live video', which was, I understand, a major element of Mr Williams' production of SUDDENLY LAST SUMMER (which I didn't see). After the Brechtian introduction to this play about THE CITY, prepared by Mr Wright for Charles Wu, an actor - with a projected scene title and explanation, we are taken to what could be a film set, with exposed wardrobe rooms and make-up mirrors on the sides, to a centrally staged scene in a Chinese restaurant, where the characters are seated around a lazy-susan table (meaning some of the actors have their backs to us and are unable to be seen face-on, and are heard, as well, through electronically boosted sound equipment), in the full flight of eating and drinking and negotiating a city deal. It is rendered to us, in the auditorium, mostly through the live projection of the actors in close-up on a looming back screen just as if we were at the cinema, so that we, the audience, are made to make a conflicting, perhaps, alienating choice, of either electing to watch the play as staged theatre or to view a live screening/projection. The production mode is set-up, unequivocally, from the get-go. I, observed to some friends, after the production, that I liked the imagery on the screen best when it served as either a backdrop - as per, the poplar trees scene - or, as animated cartoon - as, per the car driving into the city. For then, I could focus on the live figures on the stage and found myself engaged more completely with what was happening by my having to endow the action, to do some imaginative acting with them and offer some of my own cathartic energy to attempt to understand from the visible and aural clues that the actors were delivering, what to take on as valuable for my experience. I was involved more fully, both intellectually and emotively, and became 'lost' in the experience. Whereas, when watching the large screen imagery the ruthless forensic capture of the actors in that large scaled imagery, was always showing me too much obviously, and required me to, only, merely watch, rather than to participate, invent, with the performers the complexity of the dilemmas of the characters and the story. For, Hugo Weaving is giving a tremendous performance, exposing his self ruthlessly to create the ugliness of his man Ui, who rises from petty gangster to a tyrant using every means, even the most inhuman, to sustain his objective to control with absolute power - the character and the artist becoming one in this magnificent performance pursuit. The personal expenditure from Mr Weaving is breathtaking to watch in its courage. It is a pity, then, that the camera capture is so limited in its offers, to its viewers, in contrast. What the camera edits out with close-up is often the whole body revelation of character that the actor is manifesting for us through alert and detail of characteristics from the whole of his gifted 'instrument', from head-to-toe-to finger-tip. The screen imagery does not deliver the full affect of Mr Weaving's mastery as an actor - it is piecemeal and, thus, mean with its generosity towards, that artist, the actor. The editor/cinematographer (Justine Kerrigan) is the controlling 'artist' in this storytelling - the actor has to submit to the tyranny of the editor and, presumably, the director, on the screen. The audience must make a choice of the means of engaging in this storytelling, often at the cost of the full observable brilliance of what is on the stage from Mr Weaving and all the actors. Ivan Donato, especially, as Giri, is a force to watch as well (with fewer subtleties of character, than Ui, in the writing, of course) as is Tony Cogin, Brent Hill, Anita Hegh, Colin Moody, and Monica Sayers. Whilst, Peter Carroll is astonishing in his mastery of the theatre and the filmic mediums to deliver his Dogsborough with stunning clarity of intention and emotive energies. Robert Cousins' Set Design pragmatically achieves the Director's needs and the Lighting by Nick Schlieper, similarly, is a faithful 'servant' to the aesthetics of the production, delivered, no less, with craftsmanship. The Composition and Sound design, by Stefan Gregory, which seems to quote from many sources of the original period and its cinematic sound histories, including dips-to-the-musicalities of Kurt Weill and Wagner, manages to keep this long two and a half hour, no interval sit, moving forward, if not being able to compensate enough for a directing tempo-style that simply 'beads' off the many scenes without much cumulative forward theatrical energy. This production sits, relatively, inert from scene to scene. There is no real climax. It seemed to have misjudged, as well, the great actor/acting class scene, where Ui is, usually, transformed from a snivelling, unimpressive figure to that of a refined, calculating charismatic leader, for in my eyes, Mr Weaving had already travelled far down to a metamorphoses - even from the prior bar/pool room scene. The power of the acting class scene is in the theatrical transformation of Ui and not in the 'camp-comedy' of a 'Theatre Director' (Mitchell Butel). The scene's power has been subverted for easy insider-joke laughs (including swishing wig gestures) and, so, the startling horror of the lesson of the 'tricks' of media-savvy, aimed at by Brecht, was undermined. This production lacks the full vertiginous horror, comic and political, of the full-throated warning from Brecht about the inevitable behavioural repeats that marks mankind's history. The final speech/epilogue, spoken by Peter Carroll, directly to the audience, had more style than content impact, and had none of the terrible predictive truth that is usually associated with it. My memory of that final moment, of my original exposure to this play, way back, some 44 years ago, of THE RESISTIBLE RISE OF ARTURO UI, was one of a shattering fear (and consequent despair). In this moment in this production it came as a signal, relatively, that the play was finished and was simply a coda that gave relief that the long sit in our seats in the Packer Theatre was over. Still, the play is a necessary experience for the theatre goer to have in their repetoire of 'reading' and Mr Wright's version is arresting, on its own terms, and this production, by Mr Williams is interesting enough in the intellectual viscosities it offers in its imaging. And, then, of course, there is the magnificence of Hugo Weaving's performance, as Arturo Ui - not to be missed.